I’ll admit it: I stood outside of a Toys ‘R’ Us on a frigid Friday morning for my Nintendo Switch. I’ll also admit that I have yet to even bother connecting the thing to its Dock attachment. 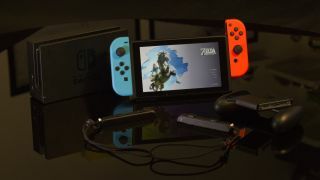 Granted, I’ve only played The Legend of Zelda: Breath of the Wild for any measurable length, but frankly, that’s enough for me to consider this Nintendo’s best handheld gaming gadget since its first Game Boy. Well, that day has finally come. The Nintendo Switch playing Breath of the Wild feels like it shouldn’t be possible. A full-fat Legend of Zelda game playing on a screen in my hands … anywhere? Before you say it: yes, we already have full-blown Zelda games on handheld Nintendo devices, like Ocarina of Time on Nintendo 3DS. But, note how long that game laid dormant on consoles before a Nintendo handheld could finally handle such an enormous game – on a dinky screen at that. Relative to the times in which they had released, playing Breath of the Wild on a Switch feels like I imagine it would to play Ocarina of Time on a Game Boy in 1998. Again, it feels as if it shouldn’t be possible yet, but here we are. In fact, maybe Nintendo should have just called the Switch a “Super Game Boy,” so as to avoid any undue bad luck regarding its recent product naming conventions. Then, today I took that same handheld device that plays arguably the greatest Zelda game ever made, slid off the controllers, and handed one to a co-worker for some Snipperclips during lunch. The fact that I can transition from playing a game that, by previous convention, should have no place on a handheld to a same-screen multiplayer session in a matter of moments is a point that should be underlined and italicized. The amount of hassle I used to go through to play a Game Boy game with my friends 20 years ago took another decade to refine and then another to perfect. The wait was well worth it. Sure, we can all say that this is what the Wii U should’ve been and enjoy being right. And sure, it’s downright unacceptable for certain pieces of Nintendo’s ecosystem – e.g. Virtual Console and online play – to be missing at the Switch’s launch. But, despite all that, the most ringing endorsement I can give Nintendo’s new console is that it feels like the veritable Super Game Boy (I still think it should've been called that) that never was. And, having that in my hands, I can wait a little while longer for those missing features – but only a little. Welcome to TechRadar's Console Gaming Week, celebrating each and every pixel of video gaming greatness. Head to our hub for what you've missed so far.